So it got me thinking what are some classics that need to be reinvented so that those who don’t eat gluten can still enjoy them? Banana bread came to mind. It’s a breakfast favorite! I kept this recipe so simple that anyone can successfully bake it and so healthy you’d never believe it by how great it still tastes. Just 5 ingredients! And ones that you probably always have on hand: oatmeal, bananas, eggs, maple syrup and baking soda. That’s it, y’all! You just blend all of the ingredients together in your blender, pour the batter into a loaf pan and bake for 20-25 minutes. It’s one of those recipes I can bake amidst the craziness of a weekday morning and we can enjoy it warm right out of the oven before rushing out the door for the day. It’s also great the next day and the next as the sugars in the bananas continue to release and make the bread even moister and sweeter. Yum! Yum! I LOVE the texture of this loaf! It’s super moist yet still has a hearty oaty texture from the ground oats. Maple syrup and ripe bananas act as the sweeteners and are one of my favorite flavor combos. Have you ever dipped banana slices in a little maple syrup as a snack?! So delicioso! You’ll fall in love with how easy this loaf is to bake and how great you can feel about eating it often for breakfast or a snack. I have the recipe memorized to where I can actually have it in the oven before my coffee even finishes brewing in the morning. That’s my kind of recipe, y’all! Hope you enjoy it too! 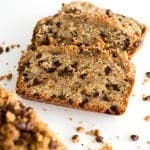 Just 5 ingredients to make this healthy loaf of banana bread that's moist, oaty and naturally sweetened with maple syrup. Preheat oven to 350°F. Lightly grease 9x5-inch loaf pan with non-stick cooking spray and set aside. 3 medium bananas is about 1-1/4 cups mashed banana or 1 pound. Oven temperatures vary so just make sure you test it with a toothpick to make sure it's baked all the way through. Mine usually takes right at 30 minutes, but others have said theirs takes closer to 40-45 minutes. Thanks Megan! I’ve never baked with coconut flour. Excited to see how your muffins turn out! I’ll have to give them a try too! not sure what kind of Blender you use…but my KitchenAid wouldn’t blend the ingredients…they were too dry. Hi Laurie! With the bananas, eggs and maple syrup the batter should blend very easily. I wonder if something is wrong with your blender blades. I use a Ninja, but I have used my mom’s older KitchenAid blender several times to make this bread with no issues. Sorry I couldn’t be of more help. Hi, do you know of any other substitutes that will work in place of the maple syrup? Is it ok if i use honey instead of syrup? If not, what would be a good substitute? Hi Shanel! Yes, honey is a great substitute for the maple syrup in this recipe. Enjoy! i have made this in muffin pan..do you have calorie sugar count. Hi Nancy! I don’t provide nutritional information at this time because everyone uses different brands of ingredients which often have differing nutritional values. I would recommend plugging the ingredients you use into a free online nutrition calculator like: http://www.myfitnesspal.com/recipe/calculator Hope this helps. Enjoy! Yum, making this tonight for this weekend! I tried the 5 ingredient oatmeal banana bread recipe and even with three very sweet bananas I could not taste banana. I’m wondering if a touch of vanilla extract might bring out the flavor? Also I had difficulty getting it to blend up but think putting wet ingredients in blender first would help. Hi Kathy! You could certainly add vanilla if you want to try to enhance the banana flavor. And yes, if your blender had a hard time with the dry ingredients on bottom, putting the wet ingredients on bottom instead is definitely worth a try. Enjoy! It DEFINITELY worked better to put the wet ingredients first! I use an old glass Osterizer Blender. The first time, I tried stacking wet and dry ingredients and it seemed dryer and harder to blend. I used a silicone spatula to push stuff down (being careful with the blades, of course), but when I put all the wet ingredients FIRST the second time I made it, I had an easier time of it. This sounds delicious! Do you think flax eggs could be used to substitute the eggs? Hi Tala! I’ve never baked with flax eggs so I wouldn’t be able to say for sure. Sorry I couldn’t be of more help. Sounds delish but it must be noted that unless you specifically use gluten free oats, the recipe is not truly gluten free as oats contain gluten (although maybe not as problematic as wheat gluten). Otherwise it looks yummy and it will definitely be something I will try. Heya! I have made my banana bread and its taste very very bitter. Can you tell me why did it happen? Hi Nana! It could be that your bananas weren’t ripe enough. The riper the bananas, the better because they are what gives the bread it’s flavor and sweetness. Hope this helps. Old baking soda will get bitter, You may have put too much in, The bananas may have been bitter. I’ve tried to eat bananas a few times that looked beautiful but were bitter and gross tasting. I started putting my entire box of baking soda into a ziploc bag to prevent it from absorbing moisture or being impacted by scents/flavors in the air. If you keep your baking soda on a shelf above your stove and do a lot of cooking in a skillet or pot, the steam and molecules from what you are cooking WILL migrate into the baking soda and change its flavor. Hi! Would you recommend changing oatmeal for whole weat flour? Thank you! Hi Valeria! I haven’t tried it so I couldn’t say for sure, but whole wheat flour absorbs less liquid than ground oatmeal so if you do try it, I’d recommend replacing the 2 cups oats with 1-1/2 cups whole wheat flour. I hope this helps. Enjoy! This recipe is so easy but very good. It’s moist and tasty and healthy. Hi Jenn! I haven’t tried it, but I think it would freeze just fine. Make sure you let the loaf cool completely then wrap it tightly in plastic wrap and place it in a freezer safe baggie to prevent freezer burn. Hope this helps. Congrats on the sweet baby girl! Enjoy! Would this work with honey rather than nape syrup? Hi! I subbed molasses for the maple syrup, but I only mixed it with a spoon and it doesn’t seemed to have turned into bread. Is the point of the blender to grind up the oatmeal? Hi Evelyn! Yes, the point of the blender is to grind the oatmeal and really blend all the ingredients together well. It’s a recipe that must be blended or you could use already ground oats or oat flour. Hope this helps. Enjoy! It soon..let me know okay? The banana slices on top are just for garnish. They’re not included in the recipe, but I’ll update it to mention them in the instructions, if desired. Enjoy! Hi Charles! 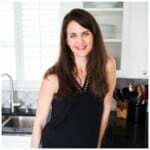 I don’t calculate the nutritional information for my recipes, but you could easily plug the ingredients into an online nutrition calculator to get the information. Just google “online nutrition calculator”. There are several free ones to choose from. Hope this helps. Enjoy! A single serving of this recipe has 96 calories. Read through the nutrition label for a snapshot of this recipe’s nutritional profile. If the label lists less than 5 percent daily value for a nutrient it is considered low, while 20 percent or more is high. In general, you want to limit saturated fat, cholesterol, and sodium, and get enough fiber, vitamins, and minerals. That is what I got from Yummly. Hope it helps! Have you tried this with frozen, thawed bananas? Also, by old fashioned oats I assume you mean rolled oats, not steel cut oats, right? I just made these using frozen bananas I thawed out and they came out great! There’s no extra moisture because bananas freeze perfectly and when they thaw it is like a brand new banana! Hellow from Vanuatu! Your receipe is the best – very simple and rich. It’s yummy. What else can you use in replacement of maple syrup? Hi Debbie! You could try honey. I made two loaves of this tonight. YUM. It’s like a big goey oatmeal loaf! The consistency is awesome and it’s just the right amount of sweetness. I “ripened” my bananas by poking holes in the peels and microwaving them for 30 minutes and I used my food processor instead of a blender. So easy! 30 minutes in a microwave? That seems like a really long time. Looks great – think this would work as muffins instead? Would anything need to be changed? Hi Amanda! I think the recipe would work great as muffins. Just be sure to reduce the baking time. I’d start checking them around 12 minutes. Hope this helps! Enjoy! I made this recipe as muffins today, and they were yummy. It made 10. Just don’t use paper..you will lose half of the muffin. Also, any WW people out there, these are 4 smart points per muffin! I baked this bread and it turned out great. I have experience baking banana bread so was a little doubtful about this recipe, I did add more time to baking about 20 minutes. Not too sweet great for breakfast. I subbed 2 eggs with 2 chia seed eggs and a splash of cashew milk for the blender to mix well. Love it!!! Sounds great! Is old-fashioned oatmeal the same as oat flour? If not, how much oat flour should I replace it with? Thanks! Hi Milly! Rolled oats and old-fashioned oats are the same. Enjoy! Hihi that means oat flour is the same? I can use the same amount? Hi Roseleen! Purchased oat flour has been through more processing than just blending whole oats so you might loose some of the nutrients, but essentially they are very similar and oat flour can be substituted in this recipe. Since I haven’t tested the recipe with oat flour, I would recommend starting with less than 2 cups since blending 2 cups whole oats would result in less than 2 cups once it’s actually blended. Enjoy! To be gluten free this cannot contain oatmeal without using GF oatmeal. Seems most everyone in our family is gluten intolerant and made the mistake of baking daughter banana bread with oatmeal and GF flour which made her so sick so I learned that lesson real quick. But I now have GF oatmeal and will be making this tonight. Can I use my stand mixer instead of a blender to mix up the ingredients? I don’t have a blender, and would really like to try this recipe! Thanks! Hi Meghan! I wouldn’t recommend it because the blender really grinds the oatmeal, whips in the eggs and blends all the ingredients in such a way that contributes to the bread-like texture. It’s worth a try though, but the texture will probably be more like baked oatmeal. This bread is AMAZING! I made 2 loaves and I am telling everyone about it! I don’t normally post comments, but I had to thank you for sharing this recipe. I’ve been trying to find healthier recipes to make for my family, especially my highly picky son. We have a WINNER! My son has demanded we always have the ingredients on hand so I can make this all the time!! 😊 I love how simple it is to make & it’s so delicious!! Hi – I made it and as my usual banana bread inspired recipes without flour or butter, it collapsed in the middle and had a sludgy texture (not bread like)….. Wondering where I am going wrong? Hi Abbey! Did you use the exact ingredients called for in the recipe and blend them in the blender? Did you test the bread with a toothpick before removing it from the oven? Sounds like yours didn’t bake all the way through. Can i substitute eggs with plain yogurt. I am allergic to eggs, so i always replace each egg with one cup of yogurt in baking. Wondering if it will work here too? Hi Preethi! I couldn’t say for sure how it would turn out because I haven’t tested it, but it’s certainly worth a try. I would suggest using 1/4 cup yogurt for each egg (1/2 cup total) as well as adding 1 teaspoon of baking powder to help the loaf rise appropriately. I hope it turns out just as great for you! Hi Tracy! I haven’t baked it into muffins yet, but several people have and they’ve raved about them. Just watch the baking time as they won’t take as long to bake as the loaf. Enjoy! I just made these as muffins. Cooked them for about 18 minutes, but they could have used a bit more. Only thing I would change is to add some spices and they would have been perfect! Can you use quick oats (like the Quaker ones I make for breakfast with boiled water and 1 minute cooking? Does it matter? Thanks! Hi Christie! You can use quick-cooking oats, just don’t cook them in the boiling water first. Enjoy! I just want to be sure. Am I adding oatmeal or uncooked oats to the recipe? This recipe looks amazing and I want to make a large batch. 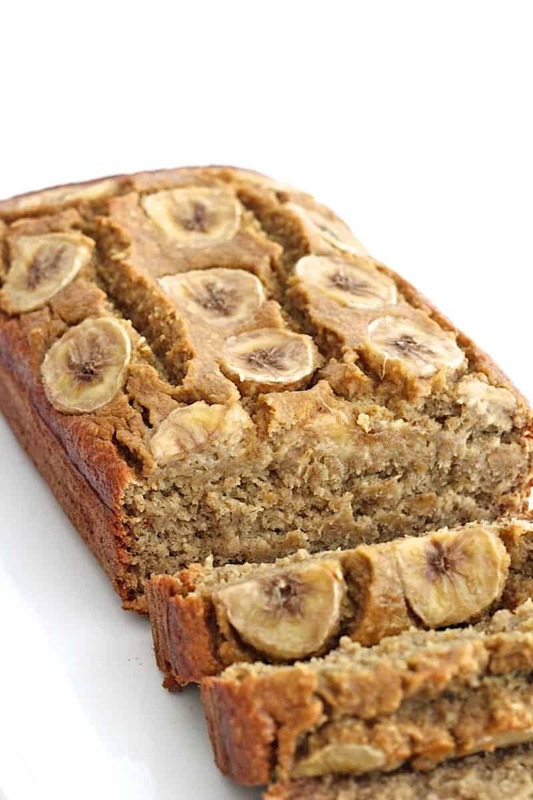 Hands down the easiest and most delicious banana bread ever! Thank you for such a brilliant and simple recipe!! P.S. 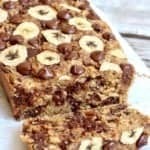 Works great as a double chocolate chip banana bread as well with added cocoa powder and 1/5 cup of chocolate chips folded in for a treat. Love hearing this, Kylie! 🙂 And LOVE the idea of adding chocolate. Yum! Yum! I made this into mini-muffins… SCRUMPTIOUS!! My friend can’t eat gluten and these are easy, fast and delicious!! Thanks so much! Love it, Deanna! I need to bake it into mini muffins. Such a great idea! Hi Denise! Yes, just let it cool completely and then wrap it tightly in freezer-safe wrap and then place the wrapped loaf in a freezer-safe baggie to store in the freezer. Enjoy! I substituted very ripe plantain for banana so it wasn’t quite as sweet but tasted great with some peanut butter spread on it! Yummy bread and love that it has oats in it (a big boost of fiber!) I also added dark chocolate chips and a dash of cinnamon. I also swapped out the maple syrup for organic honey and still came out tasty.My sister can’t have any gluten so this is a great gluten-free bread recipe that tastes delicious and is super easy to make! This has been my favorite banana bread I’ve ever made. It’s great how moist it is, and how few ingredients it requires! I’ve added flax, walnuts, peanut butter, and chocolate protein powder in different variations. Thanks for sharing! Hi! This is a delicious recipe, just want to ask wha I can do to prevent the bottom of the bread from being such a hard consistency (like the crust of regular bread) when compared to the bread as a whole? Hi Ivan! I’ve never had the bottom of this bread turn out hard. Maybe try moving it up higher in your oven as it bakes. If I want to turn this into a chocolate banana bread how much cocoa powder would you recommend? Thank you!! Hi Mary-Kate! I’d have to test it to know for sure, but would probably start with 1/3 cup cocoa powder. 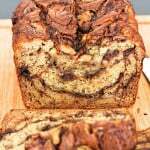 I have a healthy chocolate banana bread recipe that’s delicious too: http://9d7.b0c.myftpupload.com/recipes/healthy-chocolate-banana-bread/ Enjoy! I made two loaves of this bread last night. At first, they rose up nicely and were very light and fluffy. Then after checking and the bread was still raw in the middle, I baked again for a few minutes and they fell. The loaves came out heavy and flat. I used sugar-free pancake syrup instead of the maple. I mixed mine in a food processor. Any suggestions? Hi Niffa! You really need to use a blender for this recipe. I’m not sure a food processor could get the batter as blended and smooth as it should be. If the sugar-free pancake syrup is thinner than maple syrup it might have changed the consistency of the batter as well. Loved the recipe. 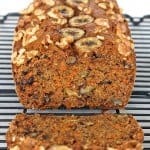 This banana bread was so delicious and moist, and the oats added a great texture to it. Made this this past weekend and loved it! Have you tried the recipe using zucchini instead of bananas? Hi Mia! I haven’t tried it with zucchini. The banana plays such a key role in the texture and taste of the bread that replacing it completely would definitely change the end result. Sorry I couldn’t be of more help. I subbed one banana for one cup shredded zucchini/and 2 bananas for 2 cups shredded zucchini, both turned out perfect! Hi. I’d like to try this recipe but would like to substitute maple syrup with normal sugar. Would this work? Hi Linda! I haven’t tried this recipe with granulated sugar so I couldn’t say for sure. Since maple syrup is in liquid form, I’m assuming replacing it with regular sugar would change the consistency so I’m not sure if you would need to adjust other ingredients to get a great bread texture. Sorry I couldn’t be of more help with this one. Maybe next time I’ll only add 1/4 cup of sugar but it didn’t taste overly sweet as it is. Hi, we made this with the maple syrup replaced with equal amount of raw sugar, and added a little milk to get the batter to be smooth. Worked a treat, but we’ll try it with honey or maple syrup next time. Making this tonight, I added 1/2 chocolate chips and 1/2 cup of chopped walnuts. So far it’s been in the oven for almost 45 minutes. I keep checking it but it’s still gooey in the middle. Is it because of the chocolate chips and walnuts? Hi Kim! If you followed all of the other ingredients and directions exactly, then I’m assuming it is because of the chocolate chips and walnuts. I’ve never tried it with those additions, so I couldn’t say for sure how much of each would be best to add and if there are any other adjustments that need to be made to accommodate them in the loaf. Maybe try covering it with foil so it continues to bake but doesn’t burn on top. I hope it turns out! Hi Karen! 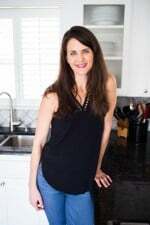 I don’t provide nutritional information on my site, but you can easily calculate the nutritional value per serving by plugging the ingredients you use into a free online nutrition calculator. Just google “free online nutrition calculator”. Hope this helps. Enjoy! I made this banana bread exactly as described, except I added a quarter cup walnuts before blending. Once I put everything in the blender, I wished I had halved the mix so that the blender could handle it. It never got all the contents blending together, just the bottom third. I manually mixed the top and the bottom of the blender contents and hit blend again, repeating this step several times. I cooked it 30 minutes at 350 degrees and it still had uncooked sections. I know I can make it appealing to eat by slicing it and putting it under the broiler to get crispy, but am wondering what went wrong. Is my blender not powerful enough? Hi Margaret! It sounds like it might have something to do with your blender. The batter should mix together easily and quickly in a good blender. It needs to be well blended so the oats turn very fine and the eggs get blended really good throughout to create the right bread texture. Can I substitute the maple syrup with honey? or are there any substitutes for the maple syrup? Hi Alisa! Yes, honey is a great substitute for maple syrup in this recipe. Enjoy! Can I substitute white sugar for maple syrup? Hi Amarah! I haven’t tried it, but I’m assuming you’ll need to adjust some of the other ingredients since the maple syrup is a liquid ingredient. Honey would make a great substitute. I made this and at first thought it was a flop but after sitting it is amazing. I used pure honey and added cocoa, walnuts, flax, and vanilla protein powder. It did take longer to cook. I think the simple base you offered leads to alot of options. It’s a keeper! Thankyou. Hi Jessie! I haven’t tried it so I couldn’t say for sure, but I’m thinking the recipe would need more liquid to soften the steel cut oats enough to chew. Let me know if you try it! Can I replace maple syrup with honey in this recipe? I want to avoid sugar. Hi Priyanka! Yes, honey is a great substitute for the maple syrup in this recipe. Enjoy! Hey, just wanted to say the first time I made this bread it turned out perfect other than I had to bake it for about an extra 10 mins, which is no big deal. The second time I added the oats first in to my blender then the other ingredients and my blender was having trouble, I think it got too dense in the bottom once some moisture hit it. So next time I will follow the ingredients list from top to bottom and it will work better. Thank you muchly for this recipe, it’s super easy and fast to prepare and very yummy!! I love it. Hi Maegan: Thanks so much for this amazing recipe! I substituted the maple syrup with honey, added a layer of walnuts under the banana slices and sprinkled approximately 1/2 tsp of coconut sugar on top. Lastly, I had to bake it for another 25(ish) minutes, but, again, it turned out amazing. I’m adding this bread to my holiday gift baskets, so thanks again! P.S. 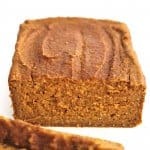 Cannot wait to try your flourless pumpkin bread – it will also likely be another gift basket addition:). Hi Sarah! That’s so great to hear! Sounds like you’ve got some yummy gift baskets in the works. Enjoy! Hi Gemma! I don’t provide nutritional information on my site at this time, but you can easily plug the ingredients into an online nutrition calculator. Just google “free online nutrition calculator”. I hope this helps. Enjoy! Hi Maegan,I just came across this recipe,had to try it immediately,it was amazing,please post more of your delicious recipes,loved it. So great to hear, Karen! And I love the twists you put into it! Enjoy! Pretty good for only being 5 ingredients. It was a little bland even though I did use very ripe bananas. Next time I may add pumpkin. Took twice the time to bake than the suggested time. Overall it was a good recipe with clean and easy ingredients. This is the best GF banana bread recipe and so moist and yummy! I added dark chocolate chips and walnuts. This is my new fave banana bread recipe. The banana bread was awesome. I did sprinkle organic coconut sugar..and yes a few chocolate chips…. on the top. So delicious I almost ate the whole loaf myself. Kids loved it!! What can I substitute for maple syrup – I cannot use honey either. Would Agave Nectar work? Thanks. Hi Sally! I haven’t tested the recipe with agave, but I think it would be a great substitute. You might want to reduce the oven temperature by 25° and maybe even tent the bread with foil toward the end of the baking time as agave tends to brown faster. I hope it turns out great! Enjoy! I have made this recipe several times love it! Trying to make it again and only have one cup of oat. What can I sub for the other cup needed? Hi Michelle! You could try substituting the other cup of oats with cornmeal, flour, quinoa, buckwheat, millet, or even crushed cereal such as corn flakes or Rice Krispies. Not sure how any of these would turn out as I haven’t tried it, but hoping you have something that works well in its place. Enjoy! This sounds delicious! Can I substitute to egg with something? Hi An! I usually recommend 1/4 cup mashed banana or 3 tablespoons applesauce in place of 1 egg in baked goods, but for this recipe, I would recommend replacing the egg with 1 teaspoon of baking soda mixed with 1 tablespoon of white vinegar to get the leavening benefits that the egg provides. Hope this helps. Enjoy! I just made this and thanks so much for sharing! Mine turned out great and it’s less of a cake (like most quick breads tend to be) and more like a bread 😊 and that’s what I was looking for exactly when trying out quick bread recipes. To be honest, I humbly admitted I did not follow the recipe to a T. I already have oat flour on hand (store bought, organic) so I gave the blending step a miss. All I used was a bowl and a fork. Mashed the bananas with a fork, add eggs and beat them together like I would to make an omelette, added 2T maple syrup and 2T date syrup (only because I ran out of maple syrup) and continue mixing with a fork. Then I added the oat flour and here is where I steered from the recipe, I used 1tsp of homemade baking powder instead of baking soda just because I felt I needed the bread to rise more and since this recipe doesn’t call for any acids I guess I could ditch the soda altogether. I did top the bread with sliced banana and threw in some roasted cashew. This bread is so easy with so few healthy ingredients and tasty and I look forward to baking it again in near future and may play around with the add ins. Thanks for providing a base for an easy GF banana bread, something me and my son (both of us GI) can enjoy. How much oat flour did you use? Any idea on what the nutrition facts are for this? Hi Jason! I don’t provide nutritional information, but you can easily calculate it yourself by plugging the exact ingredients you use into a free online nutrition calculator. There are several out there. Hope this helps. Can I use steel cut oats instead? Hi! I tried this recipe and it came out wonderful! I’m trying to cut sugar so do you know how many grams of natural sugar it has per serving from the bananas and syrup? Hi Donna! I don’t know, but you could plug the exact ingredients you use into a free online nutrition calculator that could hopefully calculate it for you. Just google “free online nutrition calculator”. Hope this helps! Enjoy! Hi Rachel! I haven’t tried it yet, but I think if they’re ground really well, they should work great. Maybe try grinding them first before blending them with the rest of the ingredients to make the bread batter. Let me know how it turns out. Enjoy! This looks great! I have some bananas that need to be used up. However, I only have 2 bananas now. I ate the third one shortly before finding this recipe 🙁 Would I need to change anything to accommodate for one less banana? Hi Ashton! If your bananas are larger, you’ll probably be fine. You need at least a cup of mashed banana. If not, you could add some applesauce, canned pumpkin, or apple to make up for it. Hope this helps. Enjoy! It came out perfectly with 2 bananas! And it tastes delicious! One more easy gf baked good added to my repertoire! Thank you! Great recipe! Thanks so much!! Added some applesauce and shredded “real” coconut on top. Used honey, did not have maple syrup. Delicious!! Not too sweet, my husband loved it! This is definitely a winner! I added a half cup of no fat Greek yogurt and walnuts on top. Thank you for this. I will try the pumpkin bread next. 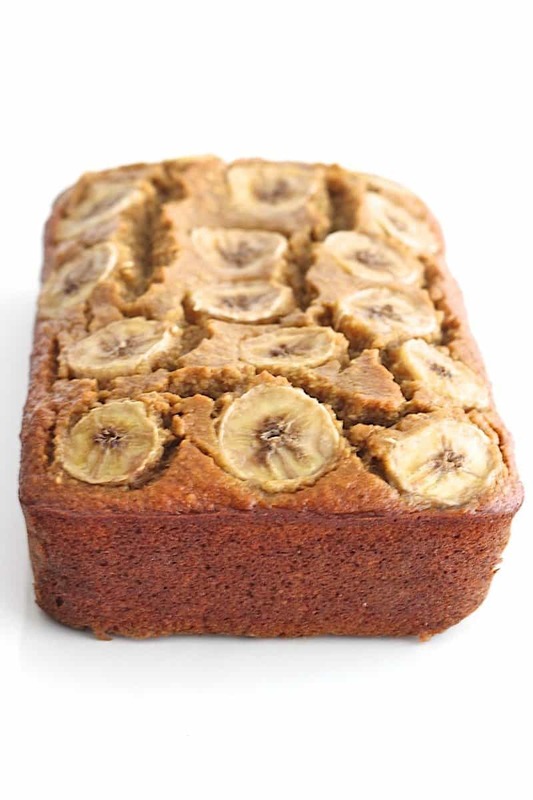 I was so surprised by the result of this banana bread – it was delicious!!! 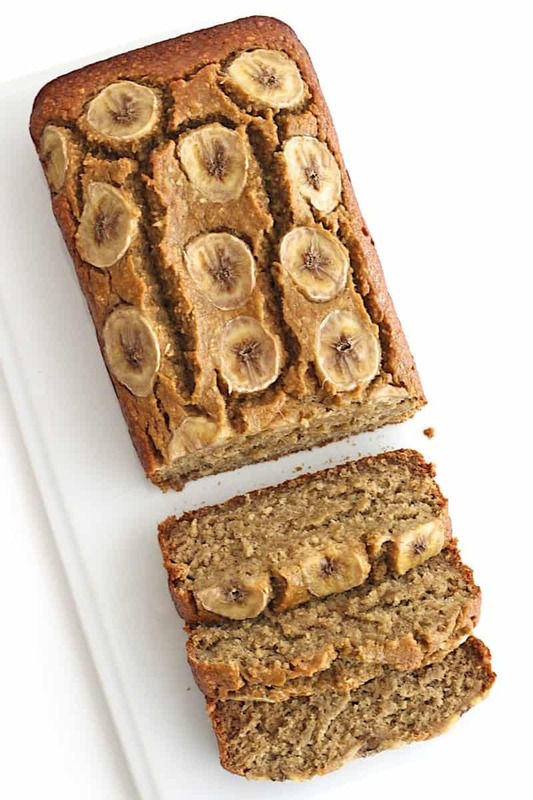 Really moist and dense, with lots of banana flavor and the perfect amount of sweetness. I traded 1 cup of steel cut oats for the 2 cups of rolled oats annotated (steel cut uses more moisture, so this ended up being a pretty good measurement for replacement). Just be sure to blend it a bit longer to break down the oats. It gives the bread a little “bite”, but I really found that pleasant. I also didn’t have baking soda, so I used 3-4 teaspoons of baking powder. Powder is much less potent, so while this may sound like a lot, it was actually perfect. Finally, I did half honey and half maple syrup as my maple syrup is a bit too dark and strong. Hi can i add walnuts? Mmmmmmm-m-m. I substituted natural honey for the syrup, and it turned out DELICIOUS!!! Thank you. Has anyone tried adding Craisins? Not sure if they would be too tart. The thought of the sweet and tart flavor might be interesting. Will probably try this tonight and let you know. Hi, this recipe sounds great, however, 3 banana sounds a bit confusing. could you please specify how many cups of mashed bananas would that make? Thanks! Hi Minoo! 3 medium ripe bananas is equal to 1-1/4 cup mashed or about 13 grams. Hope this helps. Enjoy! Another question 🙂 Would an immersion blender work here? Hi Minoo! I couldn’t say for sure because I haven’t tried it, but it’s certainly worth a try. Just make sure all the ingredients are blended into a smooth batter so you get that great banana bread texture. Enjoy! I made this last night – I didn’t have any oats in the house (I was shocked) so I used 1 cup of flour and 1 cup of almond meal (I know, not GF, but we don’t need it to be in our house)- it is absolutely delicious! Thanks for a simple, fast and yummy recipe! I love being able to just put everything in the blender and pour it into the bread pan! I will be using variations of this recipe with all my overripe bananas from now on!!! This recipe looked so promising, but unfortunately, followed the recipe to a T and now just have a burnt on the outside, raw on the inside mess. It was in the oven for over an hour (hence why it’s burnt) but can’t for the life of me work out why it’s still raw…. also seems like I’m not the only one. Any ideas on what went wrong? Hi Michaela! If the bread was burnt on the outside and still raw on the inside, I’m thinking it has something to do with your oven temperature, the placement of the loaf in your oven, or the pan you’re using. Oven temperatures can vary quite a bit. I would recommend baking it on the center rack or one rack above the center in your oven. Did you use a 9×5-inch loaf pan? Also, did you blend the batter until smooth. 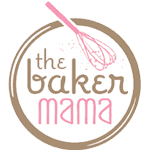 It’s such a great recipe that lots of people bake successfully every day so I’d love to help you troubleshoot so you can experience the same deliciousness. What can I use to substitute the Maple syrup? I am thinking raisins. Any other ideas? Hi Julieta! I would recommend honey as the best substitute for the maple syrup. Hope this helps. Enjoy! Have you tried adding plain greek yogurt (2%) to the ingredients as well? And what about agave instead of maple syrup? Thanks! Hi Allegra! No, I haven’t tried either of these adjustments to the recipe. Sorry I can’t say for sure if they’d work. I hope it turns out just as great for you. Enjoy! Don’t have a blender but just made these. Used my smoothie machine for the oats then mixed everything together. Also used agave syrup for the maple syrup. Cooked my mini muffins at 325 for 12 minutes and they turned out perfect. Hi! May I ask what I can sub with baking soda? Thank you! Hi Nizrhane! You can use baking powder in place of baking soda, you just need to triple the amount. You can do this because there is actually baking soda in baking powder, but just a little bit. Hope this helps. Enjoy! Hi! I made this yesterday. I used food processor and I don’t think I whizzed it long enough as my batter wasn’t smooth. I also added some walnuts and blackberries which I think made it more moist so I added some extra oats (whole). It’s a lovely dense, moist cake and I actually like the oatmealy texture of it. Took 45min to bake in my oven. Recipe is definitely a keeper as it’s a fab, simple base for a whole lot of different flavour combinations. I also popped a slice in the freezer just to check how it keeps (will report back next week when a work colleague comes back from holiday). Hi Joanna! So great to hear! Love your additions. Yes, a blender is definitely needed to get a smooth batter, but if you’re okay with a heartier oat texture, the food processor works great. Enjoy! Back to report it freezes perfectly fine. It was even more moist but I guess that would be the blackberries I added. Great to hear, Joanna! Enjoy! WOW! Would never think its gluten free. Delicious and moist. I added cinnamon and a teaspoon of vanilla extract. This will probably be the one and only banana bread recipe I will use from now on! THANK YOU! Just tried this, it was super easy to make and it was delicious!! Before putting it into the oven I sprinkled cinnamon sugar over the top! Def easy to make. I almost put brown sugar in it for more sweetness but I stuck to the recipe to keep it healthier. I did how ever add chopped nuts, flax seed, cinnamon and nutmeg. It came out very moist but not as sweet as I wouldve liked. ( I used black bananas too) Not bad though. Its good warm w butter. 1) can I use just egg whites instead of whole eggs? 2) if I substitute baking powder for baking soda (as in an earlier reply, just triple it), will it still work? Or is it better to go out and buy baking soda? 3) if I eliminated the maple syrup altogether, would that be terrible? Or just not as sweet? I’m not a big sweet tooth, but want to set myself up for success! Hi Anees! Yes, you can use all egg whites. I would suggest using 2 egg whites for each egg, so 4 egg whites total. If you substitute baking powder for the baking soda, it might give off a bitter taste because you have to use so much of it, but it will work. If you leave out the maple syrup, I would suggest adding another ripe banana for both the flavor and moisture as the maple syrup contributes to the moisture of the bread. Hope this helps! Enjoy! I made this for the first time last week and we all loved it! I’m always looking for ways to get more protein in my kiddos and my husband is celiac so gluten free is a must. I love the clean ingredients. 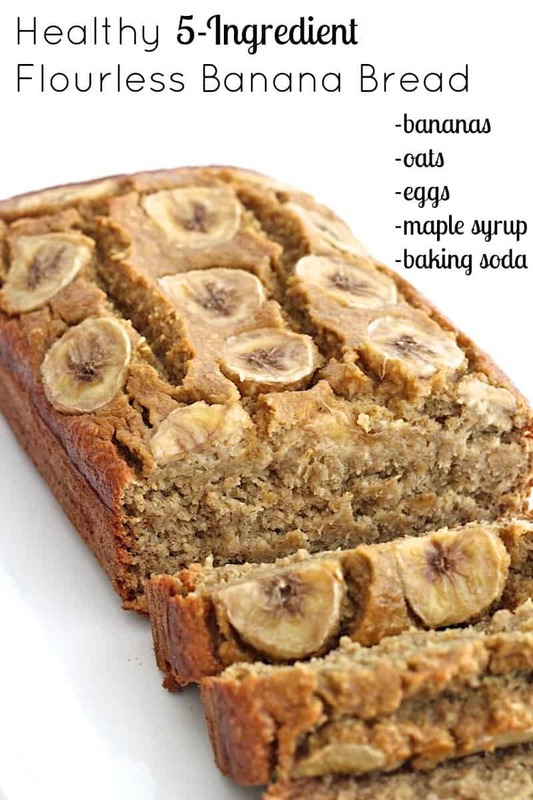 I’m making another loaf right now and this time I added a scoop of (banana) protein powder as well. I didn’t add any maple syrup either time– it is plenty sweet from the ripe bananas. Delicious!!!! I did change it up a bit Still keeping it healthy. It is just in my Cajun Blood that I do not follow recipes :} .. I added vanilla, Cinammon, raisins, and walnuts. A pinch of salt and a 1/4 teaspoon of baking powder. I also added 1 tablespoon of honey along with the maple syrup. Hello from Finland; please note that 3 mashed bananas will not make 13 grams! That is like two teaspoons….kindly recalculate. Great recipe! Hi Reija! Oh my goodness, thanks so much for catching that. I have no idea what I was thinking with that number. Just updated the post. Thanks again! I made this with a few substitutions: used cracked and toasted oats from Costco, 2 tbs of powdered chia seeds in water (as my egg substitute) and 1/4 honey because I had no maple syrup. It was not sweet like most banana breads (because it only had honey) and it was more like bread (rather than the light cakey texture from using all purpose flour). I would not call this a dessert with the lack of sugar content but it was a decent recipe that did let the banana flavor come through more (though not much) than conventional banana bread recipes (when you mostly taste sugar). I do feel better about eating it because it contains strictly wholesome ingredients but it doesn’t quite hit the spot of traditional banana breads. Also, it took closer to 45 minutes to have it fully bake on 350 degrees! Worth giving a try! I don’t usually comment on blogs, but I am just so thankful of this recipe! And guys, for maple syrup replacement, I use 2 medjool dates (pit removed) and blend! I also added 2 tbsp of raw cacao powder and it’s aaah mazing! Hi Beth! Yes, you could use an additional banana or 6 tablespoons applesauce to replace the 2 eggs. Enjoy! Sorry, it sent before I finished! Wondering if a blender is a must? Hi Roxanne! Yes, the oats need to be completely ground and blended with the other ingredients to get that great banana bread texture. You could try using a food processor or already ground oats instead of a blender. Hope this helps. Enjoy! Is there a way to combine this recipe with the one for flourless pumpkin bread to make a pumpkin banana bread mashup? Can’t wait for your reply! Hi Sharzaud! Absolutely! I’d recommend following this recipe and using 3/4 cup mashed banana with 3/4 cup pure pumpkin. Add in a teaspoon of cinnamon, if desired. Enjoy! Good morning. I just made two loaves of this bread. One of them I substituted honey. The other I substituted stevia. I also added a scoop (1/4 cup) of vanilla protein powder to each. My stomach is growling in anticipation of the result. I am hoping that the recipe turns out. Thanks you. My two loaves both turned out great. Stevia made a good substitute and will help keep the carbs down. Great to hear, Ramona! Enjoy! I made it and its ok. It was interesting to blend the mixture. I guess its a healthy version. I just think it was a little gummy sort of. I think I just prefer more of a sponge. Maybe some oats added after the blender to give it a more complex texture and maybe some bananas in the mix that were just mashed and stirred in. & honey & coco powder or a dash of instant coffee granules. Anyway, it was fun to make and its for my buddy Evan & he likes anything I bake so its sure to be a crowd pleaser. And the banana slices on top are mouth-watering. hi! I’m so glad to have discovered this recipe and it’s become my go-to portable breakfast. I found the baking time to be quite low – 45 minutes was about right for me. I also played with the ratios of flour/oats and have been using 1 cup oats, 1/2 cup AP flour (those go in the blender with the rest of the ingredients) and then stirring in another 1/2 cup of whole rolled oats and a few handfuls of chopped walnuts. it yields a bit more of a traditional banana bread texture – slightly more cakey, but using waaay less AP flour than a traditional recipe. Hi Maggie! Thanks so much for sharing! I’m glad you were able to use the recipe to make it your own. Sounds like it turned out great! Oven temperatures certainly vary so testing it with a toothpick for doneness is important before removing it from the oven. Continue to enjoy! 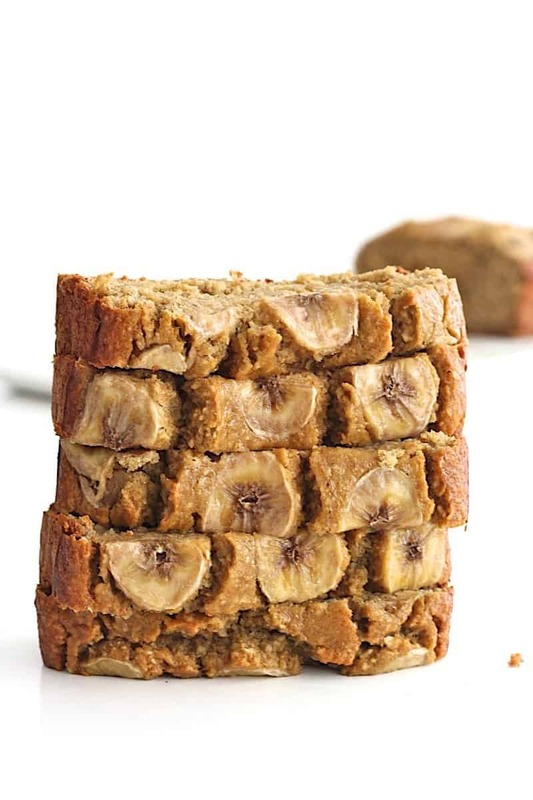 I just made your banana bread–saw it on Pinterest and it looked oh so good! I was out of eggs, but wanted to make this anyway, so I decided to use flax eggs instead and I think it dried out the bread. Eggs keep things moist and I think the flax wasn’t a good substitute. But it baked up beautifully and I definitely want to try it again with the eggs! could I use steel cut oats instead of old fashioned oats? Would that work? Hi Casey! Yes, just make sure you grind the steel cut oats really well in a powerful blender or food processor. Enjoy! I’ve been making this bread every week! Love it! My blender isn’t awesome so I grind oats in a coffee bean grinder and hand mash/mix the rest. Turns out beautifully! Thank you for this! I love how easy this is and mine came out super moist. Only thing was it was a touch bland and my bananas were extremely ripe, I didn’t skip the maple syrup either. Could it be the baking soda doing that or how could I adjust for next time I wonder? Hi Nikki! It could be a matter of preference for sweetness. You could try increasing the maple syrup by a tablespoon or two next time and see if that tastes better for you. You could try to reduce the baking soda, but the loaf would turn out denser. Hope this helps. I don’t have a blender, just a food processor. Do you think it will work as well? Hi Sharon! A food processor should work great. Enjoy! Hi there, love the recipe! Just reaching out and asking about your moms skin condition? I’m sorry if this is too personal to talk about but I’m questioning going gluten free to see if I have an allergy that’s causing a lot of skin irritations. Hi Danie! Unfortunately, giving up gluten did not help with her psoriasis, but I have heard that it does work for other skin allergies. Hope you enjoy the recipe and that are you are able to find out what is causing your skin irritations. Hi Horsey! When stored in an airtight container, it will keep 1-2 days at room temperature or up to 5 days in the refrigerator. If storing in the refrigerator, I recommend letting the slice(s) you’re going to eat soon set out at room temperature for 15-20 minutes before enjoying or toast in a toaster oven. Enjoy! Ran out of oats, so I improvised with grits! They turned out great! Love it, Jordan! I grew up on grits so this really excites me to try sometime. Thanks for sharing! Enjoy! Baking powder instead of baking soda cuts the bitter flavor you might get in a recipe. Also use bananas that are very ripe and soft, but not mushy. Add 1-2 teaspoons of banana extract to up the banana flavor. This is a yummy healthy recipe! Thank you! Yesss that maple-banana combo is the best. I still can’t believe this is a 5 ingredient recipe. Looks delicious! Hi Maddy! Yes, you’ll need to use 3 teaspoons of baking powder to substitute the 1 teaspoon of baking soda. Enjoy! Hi! can I use this recipe to make muffins as well? and do you know how many calories this recipe has? Hi Arielle! Absolutely, the recipe bakes up great as muffins. Just reduce the baking time to around 20 minutes. Be sure to check the center of each muffin with a toothpick to make sure they’re baked all the way through. I don’t provide nutritional information at this time because everyone uses different brands of ingredients which often have differing nutritional values. I would recommend plugging the ingredients you use into a free online nutrition calculator like: http://www.myfitnesspal.com/recipe/calculator Hope this helps. Enjoy! I just took mine out of the oven. It looks and smells heavenly. I added cinnamon because I like baked bananas with cinnamon. So yum! My new go to use for overripe bananas. I didn’t even add maple syrup and still loved it. Thank you! I made this as written. Blended in my Vitamix. Mine turned out like a very dense banana pudding even after baking twice as long. I reread the recipe thinking I made a mistake but no everything was exact. Maybe my blender was to powerful. Hi Grace! It sounds like you may have over blended the batter which caused the batter to heat up and start cooking the egg and oatmeal resulting in a partially cooked pudding like consistency before even baking. I’ve heard the Vitamix can heat foods while blending so maybe that’s what happened. Next time, try blending it on less power and just until the oats are ground. Hope this helps! Hi Ashley! Yes, just make sure you grind the steel cut oats really well in a powerful blender or food processor. Enjoy! Hi there ! Can we omit the maple? I have really ripe bananas ! Hi Matilde! Yes, you certainly can. Enjoy! I am going to add some walnuts to this. Do I need to change anything? Add any liquid? Hi Angel! No, no need to adjust the recipe…just stir them in the batter after it’s blended. I would recommend about a cup of chopped walnuts. Great addition! Enjoy! Thank you for responding. I made it once before and we like it. My kids requested walnuts. I have my banana bread baking in the oven right now but I am wondering why you don’t add salt to this recipe? Before I was gluten free all of the banana breads I made had some salt. Is there a reason you don’t add it? Just very curious. I almost added it but I wanted to try it how you do it first. Thanks so much! I’ll let you know how it turns out! Hi Laura! With very little sugar in this recipe, I felt even just a little salt overpowered it. Also, it’s a great recipe for those watching their salt intake. Hope you enjoyed it! Can I add carrots to the mix? I have made the bread as is, and it is amazing, but I need to spice it up for a baking contest at work. This is so easy and delicious, not to mention healthy! I’ve been making once a week since I discovered this recipe. Kids absolutely love it! Hi! I am wondering if there is a way I can make this with almond flour either as a substitute for the rolled oats or in addition to? Thanks!! Hi Alanna! Sure, just replace the 2 cups oats with 2 cups almond flour. No need to use a blender since the almond flour is already ground. Just mash the bananas and mix the batter in a mixing bowl. Enjoy! Made this twice, the firs time exactly as instructed. The second time, I used only 2 bananas and 1/2 cup apple unsweetened sauce, as well as 3 tsp baking powder instead of baking soda. Also omitted maple syrup. Made 12 medium sized muffins which came out delicious. Made with 4 slightly bruised bananas and porridge oats instead of rolled. Mashed and mixed ingredients well in a bowl first, then used a hand blender. Really excellent! Thank you. Do you have nutritional information for this recipe, please? Hi Sandra! I don’t provide nutritional information at this time because everyone uses different brands of ingredients which often have differing nutritional values. I would recommend plugging the ingredients you used into a free online nutrition calculator like: http://www.myfitnesspal.com/recipe/calculator Hope this helps. Enjoy! Just made your 5 ingredient flourless banana bread for the first time today. After I had read probably 3/4 of the comments here so as I was reading I thought I should try putting in the little bit of blueberries I had in frig. So I did. I cut back just a little on the maple syrup and I only had 1 cup of mashed banana so I added about a cup and a third of blueberries, because that’s what I had left, and baked it approximately 40 minutes oh and added walnuts as well, it turned out fabulous. I know that because I had 2 slices before it cooled off, YUMMY! I do think next time I wouldn’t use that many blueberries though it was a little too much. Very good I love it. Thank you.